It is literary a global architecture, design and planning firm that has near about 44 branches and more than 5000 professionals and spread their network across Asia, Europe, Australia and the Middle East. The firm was founded by Mr. Arthur Gensler Jr. and Associates Inc., known as Gensler in 1965 at San Francisco and in recent they are been serving more than 3500 active clients in every industry. Gensler designers are aimed to renovate the places more inspiring, more consistent and more influenced where people live, work and play. 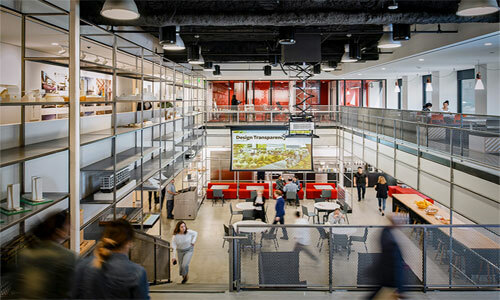 Gensler is planned for supporting their clients all over the world at every step of design cycle from primary strategy and design planning through performance and management. In this article we will come to know about the creative works and system and management about architectural visualization of Gensler from Scott DeWoody who is the creative media manager at Gensler and has the experience to work with countless clients such as NVIDIA Corporation, ExxonMobil, Shell Oil Company, BP, City Center Las Vegas and many more. Scott’s Role at Gensler: As a creative media manager Scott has to manage the rendering workflows, supervise visualization technologies, give training to the newcomers, and work on documentation over several things and research and development into new technologies like VR/AR/MR etc. Lot of roles really for him, but this is not the last as he as to act as a consultant on a huge number of projects and find out the best solution for any problem that can appear. As per the words of Scott, he and other employees can get really big possibilities of working with various kinds of clients and projects that provide them enough experience for being compatible in every field. Scott has been working in Gensler for 10 years and serving various kinds of clients everyday which give him lot of experience and knowledge and he enjoys his work a lot. Design tools: As Gensler is an architectural, designing and planning firm so the employers have to work with various tools that can make their work better in the less time. Scott says that they use the tools like SketchUp, Rhino, and Revit and for a degree use 3ds Max, along this there main visualization tool is V-Ray. The detailed works are done using the Unity and Unreal gaming tools and create some mutual visualization. Without this I Ray and other apps are used and Deadline tool is used to produce a global render in the network resources. Process of producing powerful and pleasing imagery: Though producing imagery is different for different project and different designers use different tools but in general V-Ray is used by all in every design as a baseline. This tool has been using by the designers from a long decade and with the newest versions they can create render while continuously working in a project without stopping anywhere. V-Ray is enough submissive for the artist to work on taking things in conceptual or diagrammatical way or working in the photo-realistic method to get a new view on rendering quality. The latest attempt they scaled into the designs is the materials with using a system named ‘Avail’. This is especially designed for the AEC industry and has over 1500 V-Ray materials and a shared library for the designers. Other Software named Substance Designer which is a mechanical material builder is used to make any kind of virtual thing like carpet, wood, stone or anything to give a real look. The whole library is connected with all the offices across the world where everyone uses the same palette to get their first renderings off the ground. A ‘standard workflow’: A standard workflow means an upgraded and useful workflow that is common in every field and every office of Gensler; it is the SketchUp and Microsoft. SketchUp help to dive in and mass out their ideas quickly to a downloadable textures and speed up the work, on the other hand the retailer dept. use SketchUp with Microsoft to present their design in the app on-the-fly. After that they use a mixture of Fuzor and Enscape to utilize a real-time rendering, besides these they use 3ds Max Interactive, Revit etc. also. For the game engine they have different level of thinking, all the designers want to make the gaming engines quick for modeling and want different outputs and recently working on it. Collaboration: Scott has a goal to make a firm platform of rendering across the board so for rendering he uses V-Ray’s upgrading version for all platforms. V-Ray gives him a firm platform for every design and solving problems, using materials or adding extra features. Future of design visualization: Real-time rendering is becoming popular and accessible for all and people are crazy for it but in the other hand the ray-tracing is also gaining attentions. Though they are two separate worlds, but Scott has a gut feeling that in future they can make a combination that will change the future of design visualization. Scott’s experience with Mixed Reality: Scott had some very good experience while working in this project as they worked with SketchUp viewer for HoloLens and experienced many things about proofing of concept, drooping the custom designed bridge etc. in the real-world environment etc. The team is recently working on various projects and looking forward to enhance the IoT experience in designing and hoping to take the technology to the next level. Gensel is extremely happy with their employees and convinced also that tools like SketchUp, Rhino, and VR are helping them a lot to grab something big in future. Leers Weinzapfel Associations is mainly a Boston-based award winning method which has specialized in architecture, urban and framework projects. They had worked on a tri-faculty building with an inventive timber structure for the University of Massachusetts. The principal of the associates, Tom Chung had given an interview to SketchUp team and this article is about that interview where reader can find a new method of designing for designers, effectiveness of association helped the project team for making a fascinating and continuous project. 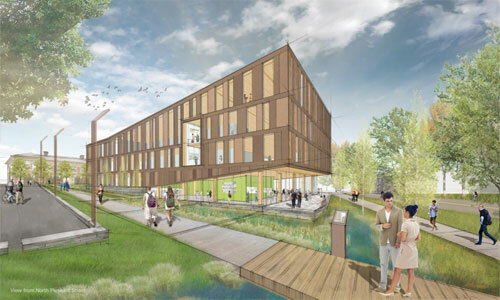 About the project: The team got a project where they had to design a new home for three agencies which were connected with the design of the building environment that was spread across the University of Massachusetts Amherst campus. In the campus, the department of Architecture, department of Landscape Architecture & Regional Planning and the department of Building Construction had to bring together so that they could have the same type of teamwork, association and advance in their disciplines. The total building had to be smart and continuous and the boundaries should be pushed of geographical, construction and landscape design in a single budget as the project was state funded. Problems in the project: The team also concerned about the previous street contexts and captured the basic views around the campus; they had expanded their site between two streets with various characters. Among the twp streets, first one was faced with the larger sized buildings of the campus and the second one had smaller structures located the historic part of the campus. They tested many locations, forms and design ways in SketchUp and their Landscape Architect, Stephen Stimson Associates suggested that both the street could be conditioned with a coherent courtyard bundled in between. Both the streets had became a common focal point in the project as it had created a common space for the citizens and visitors of the building which was started from the landscape garden on the third floor and ends up on the ground floor to welcome the least of the campus. They made this ‘commons’ space in an animated way with a dynamic 3D truss which was made with Glulam beams and metal tension rods. It was basically made as a support for the roof garden that had up to 18’ of soil and dense planting. Reason of selecting timber in this project: Alexander Schreyer, chair of Building and Construction was the main enthusiast for using the timber structure in the project of the client. Alex had knowledge and interest on this matter and gave the team confidence for using timber in the project. They took help form some specialist timber structure engineers, Equilibrium Consulting and as a result they had arrived as the first group timber structure of its size and scale in the United States. In this timber made structure, the structural body was of glulam beams, the columns and the floor deck was the unique combination of Cross-Laminated Timber or CLT and concrete. The complex floor was combined of wood and concrete for creating delegate long spans which were stable, serviceable and wonderful for controlling vibration and auditory. SketchUp in design process: According to the Leers Weinzapfel Associations, SketchUp is a very useful tool for them and could easily model things for having the skill and energetically works on projects. They had tested various absorptions and conceptions which vary on the location form the Google 3D map and plug in their design for the contextual fit. The walk-through feature also helped them to capture and demonstrate the quality of the main spaces. For changing the design they transferred it into the construction documents created in Revit. They also had focused on specific conditions in SketchUp before centralizing it into the final drawings and this method was become helpful for further long term deign processes. Project’s point of continuity: A timber structure defined that it is a sustainably harvested renewable material with very low illustrated energy and carbon. The instant nature of the timber structure also decreases on-site labor demanding processes and accelerates the building process. Choosing the timber structures instead of steel and concrete also could leave a big impact on global carbon emissions and can make the world healthier. Besides the specification on the material, they also had a limited budget that prevented them from using costly bolt-on renewable strategies at the end of the work. But it is also true that the building consumed less energy from the beginning and they used a LEED Platinum rating and renewable energy sources due to their cost boundary in the project, so they used campus’ existing chiller system that was very helpful. They also planned spaces for fitting the mechanical heating and cooling services. Role of collaboration in the project: In this low-budget project, collaboration played an important part which was very much necessary for the success of this project and the collaboration could be seen everywhere. The collaboration between the team and the clients showed by the three different UMass department heads, they also used their imagination in various way into the dimensional planning of the building ensured the chance encounters between the students and faculty in the departments increased. The sustainability consultant, Atelier Ten, MEP engineer, BVH Integrated Services were there with the team from the beginning and by handling massing, orientation and façade design they made an energy efficient building. Though their method was not familiar in the Boston Area of the United States they tried their best to make the project successful and they did it.